Kicking off our project blog, Kate Dawson, a communications consultant (Well Read) describes how she and Michael Faulkner of Heritage First are working with local heritage groups to research the content for an education pack, exhibition and brochure that will help tell the story of the Clock Tower and Coalville’s Memorial sites. 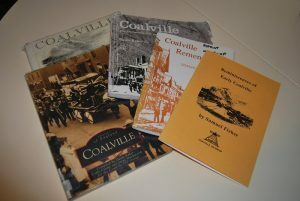 Now that our work to collate the history of Coalville’s commemorative sites has begun, it feels like the clock (Tower?) 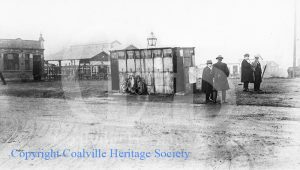 is already ticking to, not only, gather as much information as possible about the Memorial Clock Tower and Memorial sites around Coalville, but ensure that we don’t leave any stones unturned. Given the absence of a Tardis or perhaps Nicolas Lyndhurst (of Goodnight Sweetheart fame, not Rodney Trotter!) to help us out, we are relieved to have been offered help by Coalville’s answer to the Dan Snow and Lucy Worsley in the forms of Stuart Warburton and Steve Duckworth from Coalville Heritage Society (I haven’t quite figured out which one is Lucy yet!). With Stuart’s experience of curating heritage projects and Steve’s portfolio of local history publications, we know we’re in safe hands. Reinforcements come in the form of the Roger Bisgrove, or ‘Bis’, representing Swannington Research Trust and Nita Pearson of Friends of Thringstone. Before long we have access to a selection of old photos and pieces of research relating to the construction of the Clock Tower and significant historic buildings around Memorial Square, with the odd ‘local legend’ thrown in. Did you know, for example, that in the picture below (taken in Memorial Square), the bicycle was said to have been welded onto the temporary public loos as a prank? We’re not sure this would have been possible at the time, but why let the facts get in the way of a good story! We’ve also popped into the local studies library and picked up a few books, to add to those we’ve kindly been loaned by Coalville’s Heritage Society – a little light reading to keep us going. And no heritage interpretation project is complete without a trip to the Archives, in this case Leicestershire Record Office. So, armed with our pencil, ID card and library whisper, myself and colleague Michael Faulkner have delved into the huge leather-bound tomes of ancient Coalville District Council Minute books, handwritten in beautiful italic writing. Amongst our finds there’s an entry of meeting minutes, dated 1/12/1925 stating that the clock tower be insured against fire and lightning for the sum of £1500 – that’s approximately £87,000 in today’s money. We also review old parchments maps to see what we can find, amongst these a beautiful map dated 1881 showing not only the old Memorial Square and War Memorial, but the Railway Waggon Works, the Co-op Bakery and the Daimler factory, which was destroyed by bombing in 1941. Amazing to think that the Clock Tower has withstood these attacks – like a defiant symbol of the town’s resilience and patriotism. Like most research projects, we don’t yet know how much we don’t know, but we’re off the blocks and have made a good start. If you’d like to get involved with some of our research in the archives or local studies library we’d welcome an extra pair of eyes. Or perhaps you have information, books or old photos relating to the Clock Tower or Memorial Square? If so, we’d love to hear from you! Please get in touch by emailing history@memorialclocktower.org.uk or calling us on 01530 229690.